Stars in dwarf spheroidal galaxies behave in a way that suggests the galaxies are utterly dominated by dark matter, University of Michigan astronomers have found. Astronomy professor Mario Mateo and post-doctoral researcher Matthew Walker measured the velocity of 6,804 stars in seven dwarf satellite galaxies of the Milky Way: Carina, Draco, Fornax, Leo I, Leo II, Sculptor and Sextans. They found that, contrary to what Newton's law of gravity predicts, stars in these galaxies do not move slower the farther they are from their galaxy's core. Astronomers already know stars in spiral galaxies behave in a similar way. This research dramatically increases the available information about smaller galaxies, making it possible to confirm that the distribution of light and stars in them is not the same as the distribution of mass. "We have more than doubled the amount of data having to do with these galaxies, and that allows us to study them in an unprecedented manner. Our research shows that dwarf galaxies are utterly dominated by dark matter, so long as Newtonian gravity adequately describes these systems," Walker said. Walker received his doctorate from U-M earlier this year and currently has a post-doctoral position at the University of Cambridge in the United Kingdom. 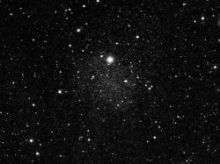 Dark matter is a substance astronomers have not directly observed, but they deduce it exists because they detect its gravitational effects on visible matter. Based on these measurements, the prevailing theory in astronomy and cosmology is that the visible parts of the universe make up only a fraction of its total matter and energy. The planet Neptune was once "dark matter," Mateo said. Before the term was even coined, astronomers predicted its existence based on an anomaly in the orbit of Neptune's neighbor Uranus. They knew just where to look for Neptune. For the past quarter century, astronomers have been looking for the Neptune of the universe, so to speak. Dark matter could take the form of dwarf stars and planets, elementary particles including neutrinos, or hypothetical and as-yet undetected particles that don't interact with visible light or other parts of the electromagnetic spectrum. Dark matter is believed to hold galaxies together. The gravitational force of the visible matter is not considered strong enough to prevent stars from escaping. Other theories exist to explain these discrepancies, though. For example, Modified Newtonian Dynamics, Mateo said, proposes that gravitational forces become stronger when accelerations are very weak. While their results align with current dark matter models, Mateo and Walker say they also bolster this less-popular explanation. "These dwarf galaxies are not much to look at," Mateo continued, "but they may really alter our fundamental views on the nature of dark matter and, perhaps, even gravity." Walker will present a paper on these findings on Oct. 30 at the Magellan Science Meeting in Cambridge, Mass. The paper he will present is Velocity Dispersion Profiles of Seven Dwarf Spheroidal Galaxies. It was published in the Sept. 20 edition of Astrophysical Journal Letters.